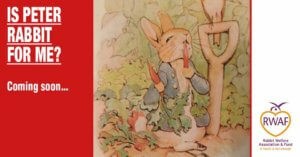 The long anticipated Peter Rabbit movie will be released in the UK on 16th March. A much loved, long-standing fictional character, yes, but the release of this film will undoubtedly increase the number of children who see the film to want their very own Peter Rabbit. Sadly, many parents will give in to ‘pester power’. 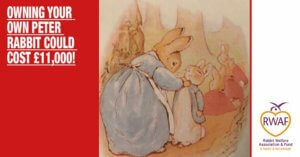 Please, please join us in spreading the message by sharing the 10 rabbit facts as far and wide as you can. Thanks. 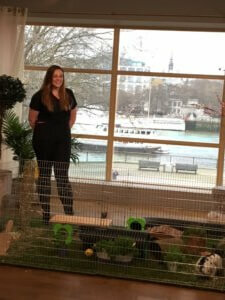 If you know of anyone who is thinking of buying pet rabbits, please share. Fact #1 300 poos a day! 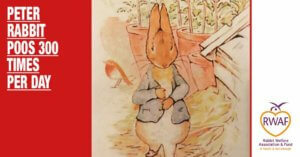 Yes, okay, Peter Rabbit is uber-cute and you’ve seen the film and fallen in love. BUT, did you know that the average ‘output’ from a single bunny in a given day is 300 poos? We kid you not. That’s quite a lot of clearing up isn’t it?! Rabbits are pretty good at learning how to use a litter tray, but it does require a bit of patience and a lot of time to teach them. Have you got that time and patience? You can expect to have a thorough clean out at least once a week, but there will undoubtedly be some daily housekeeping duties to attend to in order to ensure that your rabbits living quarters remain clean and disease free. Thinking that your child will take on this responsibility? Not in our experience. 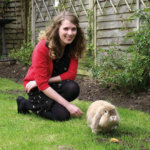 Children lose interest in pet rabbits really, really quickly, leaving Mum or Dad on poo duty! So you’ve seen the Peter Rabbit movie and have decided you just have to have your very own Peter Rabbit. Rabbits are cheap pets right? You are *joking*! On average, a pet rabbit will cost the owners over £5,000 during their lifetime. Rabbits will need to be neutered and have regular trips to the vets for vaccination against Myxomatosis and Viral Haemorrhagic Disease. If you are planning on getting rabbits as pets, you are most definitely recommended to get pet health insurance. 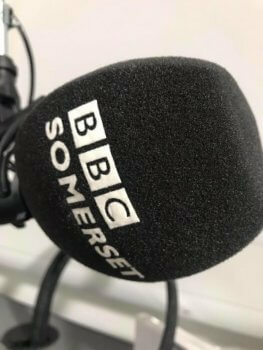 This can cost upwards of £60 per year, per rabbit. Even so, rabbits often have dental problems, which are rarely covered by insurance. If your rabbits are affected (and they are very likely to be, unless you feed them a grass/hay-based diet!) then the cost of essential regular dental treatment can quickly add up to hundreds of pounds each year. 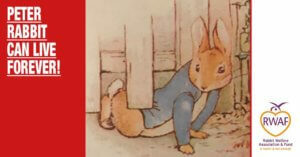 Fact #3 Peter rabbit cannot live in solitary confinement, that would be cruel. 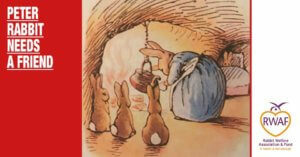 Even in the story, Peter lived with Flopsy, Mopsy, Cotton-tail and his mother. Did you know that rabbits are actually very social creatures. Wild rabbits live in colonies, never on their own. 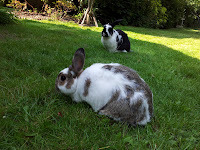 Rabbits should be kept in neutered pairs or compatible groups. Recent scientific research has confirmed that rabbits suffer from stress and loneliness if kept alone: they value companionship as much as food – and you wouldn’t keep them without food, would you? So if you are seriously thinking of getting a rabbit, better make that rabbits as it would be cruel to keep one on its own. And remember the 300 poos per day, that’ll increase to 600 when you get a friend for your rabbit. Not to mention the vet bills covered in fact #2. 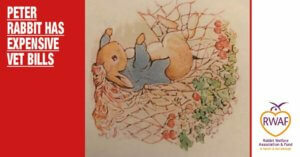 In the original tale, Peter lived with Flopsy, Mopsy Cotton-tail and his mother underneath the root of a fir tree. The reality is that Peter Rabbit and his friends in the real world need much more consideration for their living quarters. 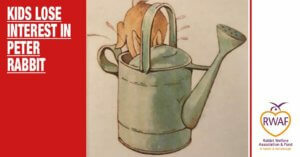 Did you know it was the Victorians who first kept rabbits in hutches – a short term storage solution before the animals went to the pot? Rabbits are not designed to live in a confined space. In the wild they roam over an area equivalent to 6 football pitches. They’re not designed to live alone either – wild rabbits live in large social groups, foraging, grooming each other and huddling together for warmth. Rabbits living alone experience high levels of stress. The Rabbit Welfare Association & Fund recommends a minimum area of 10 x 6 (3m x 2m) which includes a shelter of minimum size of 6′ x 2′ x 2′, which allows rabbits some room to move, stand on their hind legs and enough space for the food, toilet and sleeping areas to be kept apart. It is commonly accepted that a rabbit should have space for 3 hops, but it is commonly underestimated just how far 3 hops is – our tests show that 3 hops from an average sized rabbit covers 6-7 feet! Please bear in mind that these recommendations are all minimums – and like many things in life, bigger is better! It’s a great myth that rabbits are cute and cuddly. Take it from us, they are not! If you and your child have seen the Peter Rabbit movie, no doubt you’ve fallen in love and think what a great idea it would be to have one as a pet. Yep, no doubt about it, kids lose interest and very often less than six months after buying the rabbits. 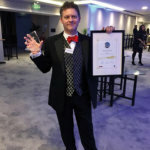 It’s not a good result for the rabbits (did you know there are currently ~67,000 rabbits waiting to be rehomed in the UK) and not a good result for the parent (what about all the money you spent on the hutch cage/food/vaccinations/neutering etc!). Fact #7 Rabbits cost more than you think: £11K! 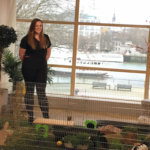 £11K, for rabbits? We’re kidding, right? No, we’re afraid not! Building a safe, secure outdoor enclosed complex can cost several hundred pounds. Or, if you decide to keep your rabbits indoors, an indoor cage (remember that our minimum size of accommodation is the same as for outdoor rabbits) and essential equipment will not leave much change out of £300. Your rabbits will need regular supplies of a good quality rabbit food, hay, and bedding. We estimate that a pair of rabbits (and remember it cruel to keep just one rabbit) over their lifetime will cost around £11,000 – can you afford that? 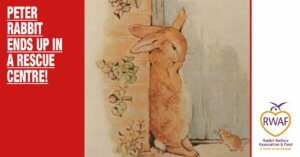 The Tale of Peter Rabbit is charming for sure and depicts a simple, idyllic lifestyle with Peter and his brothers and sisters being let out to play with hardly a care in the world. This is a long way from the reality of having rabbits as pets. • A companion rabbit – rabbits need the companionship of one or more neutered rabbits. 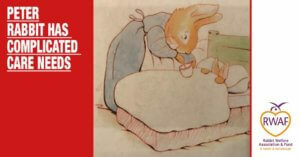 So if you are still planning on getting your own Peter Rabbit, make sure you get a Flopsy, Mopsy and/or Cotton-tail too. • A hay based diet, with pellets and greens every day. Not lettuce though, this is soporific for rabbits and shouldn’t be fed. 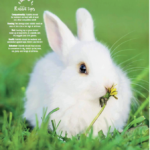 Without the right diet, rabbits can develop diseases and have problems with teeth. • An area 3m x 2m (10 x 6ft) to live in all of the time, regardless of whether they are inside or outside. Yes, all of the time! This should have a shelter area, as well as a digging pit, a grazing area, a platform to look out from and room to rear up tall, run, jump and binky! • Taken to the vet at the first sign of change in eating habits or poo. Tomorrow is too late, if this means the emergency vet, then the emergency vet it is! Okay, we’re exaggerating, but I bet you get a shock when you learn that it is not uncommon for rabbits to live for 10 years or more. Some rabbits have been known to live for 15 years! 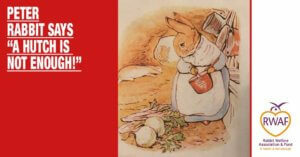 Rabbits are often acquired for children (frequently following displays of “pester power”!) but it is essential to remember that the adult is always responsible for any pet… therefore at least one adult in the household must be prepared to commit sufficient time, energy and money to the rabbits for the next decade. Don’t forget, Peter, Flopsy, Mopsy and Cotton-tail may still be alive and kicking when your child heads off to College or University leaving you firmly with the responsibility! Rabbits are not cheap and easy children’s pets! 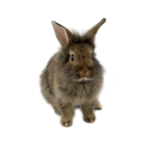 #1 – a single rabbit can produce up to 300 poos per day. Wow, that’s a lot of clearing up! #4 – rabbits need huge hutches – have you go the space in your home or garden. Did you know a suitable hutch complex can cost several hundred pounds? #5 – rabbits, despite their appearance do not like being picked up and cuddled and can get aggressive when they become frightened. #6 – children get bored of pet rabbits. It’s fact. Don’t give in to ‘pester power’. #9 – rabbits can live for 10 years and over. Many people don’t factor this in. 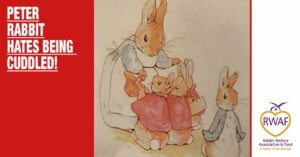 We hope you enjoyed our 10 facts helping you to decide if you really want your own Peter Rabbit. If you know of anyone who is thinking of buying pet rabbits, please share.